National Testing Service is the Largest Testing Organization in the Pakistan That conduct Different Types of Tests for Different Departments of the Country including, Government, Semi Government and Private Departments. Candidates can apply for many jobs by visiting National Testing Service website for various new Jobs Announced through NTS. It also evaluates Students applying for Universities by conducting GAT tests and NAT tests which are taken four times in the year. 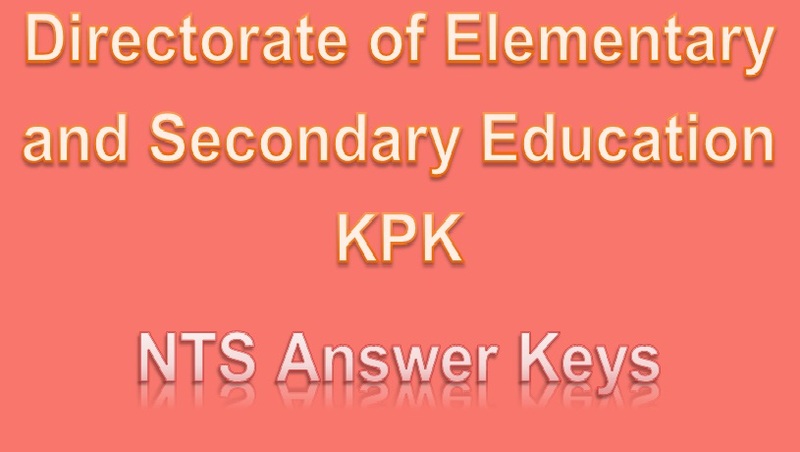 Now NTS has uploaded Answer Keys for the test of District Cadre Various Vacant Teaching Jobs in Directorate of Elementary and Secondary Education Khyber Pakhtunkhwa 2018 published in Different Leading Newspaper of the Pakistan. Last date for apply these jobs was 20th December 2017 and Tests was Conducted on 06th, 07th and 08th April 2018. Candidates who have applied for CT Teachers and TT Teachers can Check Their Results on NTS Answer Keys. These jobs were announced in DEO Bannu, DEO Buner, DEO Charsadda, DEO Chitral and DEO Kohat.